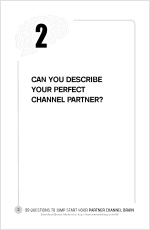 Home → Uncategorized → Can you describe your perfect Channel Partner? Funny how first experiences color all subsequent encounters. As a freshly minted engineering graduate, I was recruited by Intel in 1979 to be the first person to go through their engineering grad-to-field sales training program. Truth be told, there really wasn’t any grand plan (or program) as the company literally made it up as we progressed from one assignment to the next. Clearly, if I was the kind of person who was seeking the rules and regulations of a formal training program I would have quit on Day 1. For me, it was ideal. While some of the others in the training program took advantage of the freedom (and got fired… one guy went to jail), I went for all the gusto! If there was an opportunity to learn something or meet people, I was there. In my first four months I shared the podium with Gordon Moore for campus recruiting strategy sessions (yeah, college recruiting was that important! ), ran a training program for Gordie Campbell’s marketing staff and admins on Intel history (my curriculum was a book from Radio Shack), and did one-off research “projects” for John Doer, then a field sales guy back in the Chicago office, where I would report after my initial stints in Santa Clara and Hillsboro, Ore.
On my very first day, though, I attended new employee orientation, hosted by Andy Grove. While I don’t recall any of Andy’s presentation, I do remember the session on the importance and reliance Intel placed on it’s distributors like Hamilton-Avnet, Arrow Electronics and Wyle. We learned how Intel avoided channel stuffing (a sin of many companies to this day) and about the relatively high percentage of business Intel expected to flow through its distribution channels (I believe it was ~30%). These guys had a plan and were hellbent to achieve. You have to know Intel was not on the top of the line card for any of our Distributors at the time. That was a position held by Motorola and Texas Instruments. Intel was an up-and-comer, no doubt, but it took a lot of effort to win the top slots. Do you have such a profile of measurable characteristics? Or are you, like so many, doing business with Channel Partners who are “nice guys,” but fail to measure up? And if you have a profile for your best Channel Partners, when’s the last time you put them through the paces, to see if they still measure up?